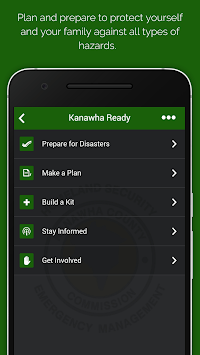 KC Ready is a disaster planning aid and awareness tool for Kanawha County, WV. 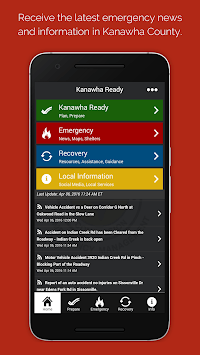 KC Ready is a disaster planning aid and situational awareness tool for residents of Kanawha County, West Virginia. Experts know that we cope with emergency situations easier when we're prepared for them. KC Ready makes planning easy. Building a kit of emergency supplies for your home is a cinch. You can even set reminders that will let you know when any of your supplies are about to hit the expiration date. A "news feed" that lets you know about certain situations that first responders are dealing with anywhere in the county. 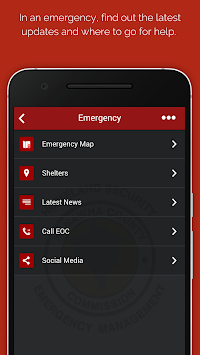 Urgent emergency alerts are pushed to your phone with a distinctive alarm. Build your emergency plan and supply list, then email them to other family members. Keep backups on your phone's cloud. An emergency map can display shelter locations, water distribution points and other key information. Live traffic map shows where the delays are, and where they aren't. Quickly locate Facebook and Twitter feeds for our local emergency services agencies and the Kanawha County Commission. Quickly access information, including immediate weather threats from the National Weather Service. In the event of a state or local disaster declaration, our Recovery section has information on how and where to apply for disaster assistance. Find information from your local community government. In Kanawha County, our government leaders and emergency responders work hard to be READY for any calamity that might strike. We want you and your family to be READY too. Being KC Ready makes us all safer.